Tis-Se’-Yak and her husband journeyed from a country very far off, and entered the valley of the Yosemite foot-sore from travel. She bore a great heavy conical basket, strapped across her head. Tis-Se’-Yak came first. Her husband followed with a rude staff and a light roll of skins on his back. They were thirsty after their long journey across the mountains. They hurried forward to drink of the waters, and the woman was still in advance when she reached Lake Awaia. Then she dipped up the water in her basket and drank of it. She drank up all the water. 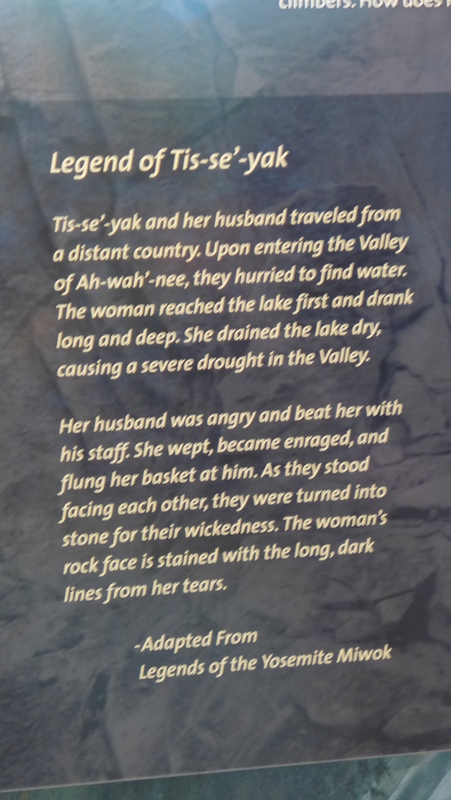 The lake was dry before her husband reached it. And because the woman drank all the water, there came a drought. The earth dried tip. There was no grass, nor any green thing. But the man was angry because he had no water to drink. He beat the woman with his staff and she fled, but he followed and beat her even more. Then the woman wept. In her anger she turned and flung her basket at the man. And even then they were changed into stone. The woman’s basket lies upturned beside the man. The woman’s face is tear-stained, with long dark lines trailing down. South Dome is the woman and North Dome is the husband. The Indian woman cuts her hair straight across the forehead, and allows the sides to drop along her cheeks, forming a square face.